In the past two years, humans have created more data than in the previous ten or so millennia. In an age where anyone with a smartphone and network connection can access a decent chunk of that data, you might think that individuals in 2016 are well-informed on every topic under the sun. Unfortunately, because so much information is produced each day, and so little of it is fact-checked, people are often duped by poor research or simply wrong "evidence." This abundance of data is especially prevalent in the food industry - particularly when determining what constitutes healthy eating and 'clean labels'. Each day amateur bloggers, scientists, and journalists create so much data pertaining to food, especially when it comes to how food can and should be labeled. These blogs and columns often prescribe wildly different advice on the topic of food labels, in particular what constitutes a 'clean label', making it difficult for consumers today to sift through what's good or bad information. At C+R Research, we've worked hard to cut through the masses of data and research how consumers really feel about clean labels. The phrase "clean label" is mired in ambiguity, but determining how consumers talk about it in relation to food products clears up its meaning. Foods can qualify for a "clean label" if they exemplify any of the following attributes: fewer ingredients, preservatives, or a warning label about "hot button" ingredients such as sodium or certain kinds of sugar. The effort to eat 'clean label' foods is often embedded in a consumer's food philosophy. This type of consumer frequently strives to eat foods with a short ingredient list that consists of ingredients they can pronounce. C+R interviewed 965 gen pop consumers in a self-administered online survey in May of 2016 to better understand how consumers feel about food and, of course, clean labels. We asked consumers about their eating habits in the past year, concentrating on whether they've changed the categories of foods they eat, and if so, for what reasons. Consumers self-reported their knowledge on a variety of topics, including food labels, nutrition, and dietary habits. In addition, we asked them to tell us how important each of those subjects were when it came to their own food purchasing behaviors. What follows are some of the salient findings from our recent study. Let that sink in. Nearly three-quarters of consumers are reading the labels on their food, and over one-quarter do so with almost every item they buy! 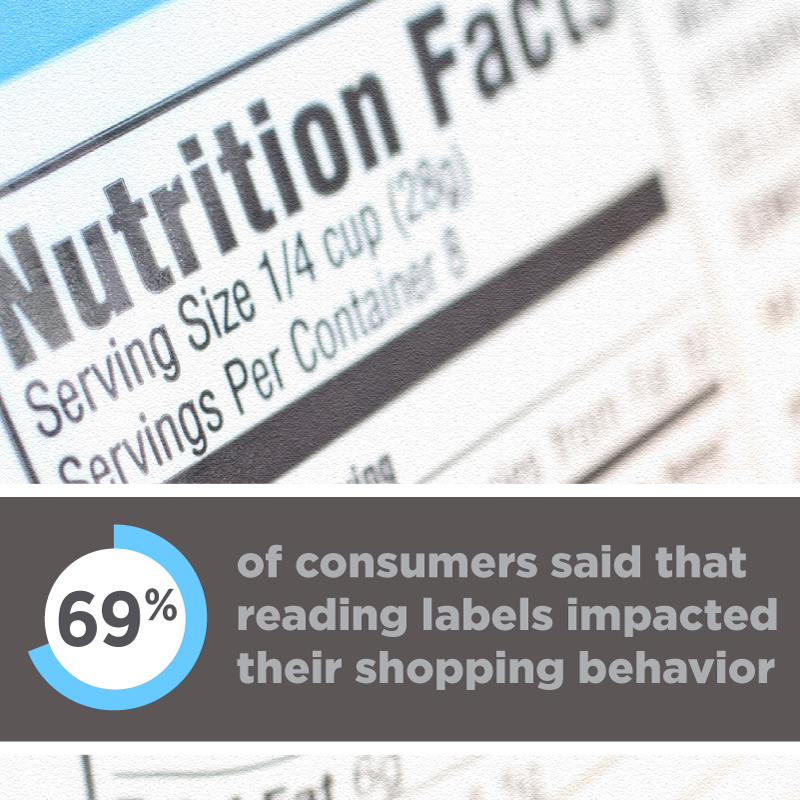 Consumers clearly see label-reading as a valuable use of their time at the grocery store, and label reading impacts what specific foods they buy. We classified these three behaviors as constituting "clean eating." Consumers didn't cite these types of behaviors to explain why they were eating less of just the food categories described above either. This clean eating was prominent across many other categories as well. It's no surprise to us that consumers are changing what they eat in an effort to become healthier, and labels are a powerful reason behind consumers' changing behaviors. Food producers can benefit from the knowledge that consumers are basing many of their purchasing decisions on food labels and should recognize it as an opportunity to communicate with their customers on the front and back of the package. Given consumers' concerns about healthy eating, companies can highlight health claims on their packages, and although such claims have appeared on packaged foods for some time, consumers may be more likely to pay attention to them now. Similarly, foods with fewer ingredients may catch shoppers' eyes more than they used to. Brands like Haagen Dazs and Pillsbury recognized and have been acting on this for quite some time, and now is a critical time for others to follow suit. Brands must also learn to speak the right language to each segment of their consumer base. Every generation has different concerns, and companies must customize their communication to fit their target market. Through the data collected in our study, we've developed a segmentation classifying consumers based on their attitudes toward food labeling that can help direct insights in this area. We'll have much more to say in the coming months about how different generations and segments think and feel about food labeling and more importantly, how to communicate with each of those groups.